Miliband went on to say that a Blair presidency would be “very good for Britain as well as very good for Europe” and said he was “puzzled” by Conservative opposition to the prospect of having a British politician in such a senior European role. 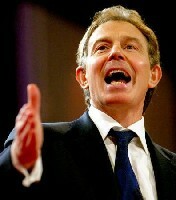 Miliband, Tony’s “Cronie-in-Chief” appeared to suggest that Blair would only take the job if it gave him actual political power. The EU meets on 29th October to decided upon the remit of its new president. Of course, absolutely nobody should be in the least bit surprised at this. Mr Miliband, together with his master, Mr. Brown, his cabinet colleague, Mr Straw and his friend, Mr Blair are four British men who share a unique – and utterly treasonous – distinction: that they put their hands to two unique documents. Messrs. Blair and Straw set their hands to the text of the European Constitution. Messrs. Brown and Miliband set their hands to the text of the Lisbon Treaty. Before Lisbon their defence counsel could have sought to argue that they were Not Guilty as the United Kingdom had merely co-operated by treaty with other sovereign states and that the legal powers used by the European Union were not its [the EU] own but those of its members, the sovereign states. Lisbon however changes all that. By giving the European Union a legal personality they give the European Union a status and power of its own, which is independent of and superior to those of its members who are now relegated to the status as suzerain or vassal states. Lisbon provides but one answer: Blair, Brown, Miliband and Straw are Guilty of High Treason.